At Aroma Thyme we don't serve farmed salmon of any kind, period. It is not natural and not healthy for us and the environment. 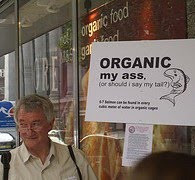 So don't get tricked into eating so-called organic salmon. Increasingly, conscientious chefs and consumers are choosing organic products as a way to protect their health and the environment. Unfortunately, the organic label on net-cage farmed salmon is misleading, and is blurring the line between conventional and organic food production. And check out the show's archives for the multipart series, Norway, British Columbia, in which host Jon Steinman explores BC's salmon farming industry. I just noticed this label in Shoprite and questioned its validity. Organic farmed - seemed like an oxymoron to me. Thanks for clearing this up.